The right interiors set the mood of your home. Bold colours energize and rustic furnishings bring comfort. Today, we’ll tour a modern villa that inspires tranquility with its restrained palette. White, grey, and natural oak at the heart of the design. They anchor the home in its effortless style. On our tour, we’ll see modern and luxurious fixtures and spacious interiors. Our last stop will be a quick visit to the special wine cellar that transports us to Medieval Times. Get ready to feel serenity wash over you as we begin our tour! The home has a grand modern entrance. It feels like we’re entering a compound! 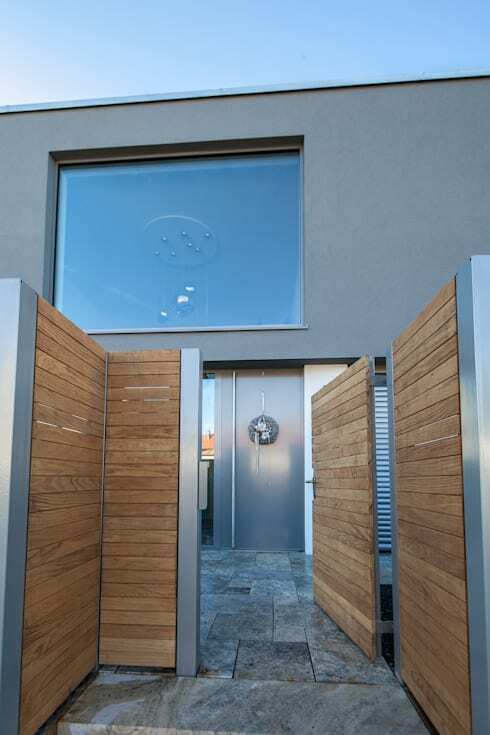 Wooden fences provide privacy and foretell the oaken interiors inside. Richly detailed stone tiles lead up to the front door. Sleek and grey, it reflects the modern sensibilities of the home. 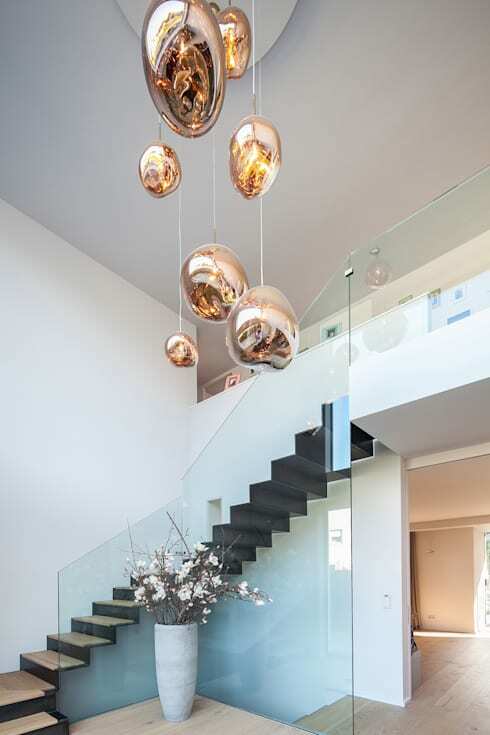 High ceilings and a voluminous copper light fixture in the foyer bring subtle drama to the home. We love the staircase because of its slender design and black accent make it a highlight of the room. 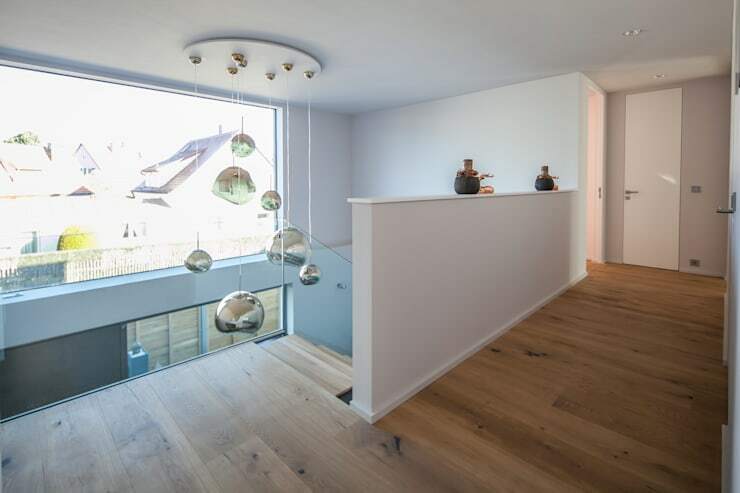 The designers used glossy sheets of glass to create banisters and railings for the staircase and the landing above. Upstairs we can see how large windows brought in an abundance of light to the foyer. The light fixture acts as a piece of artwork with its sculptural shape and gleaming reflectivity. The interiors of the home are bright and white, pairing nicely with the simple oak floors. A simple palette like this brings delicate luxury to any home. 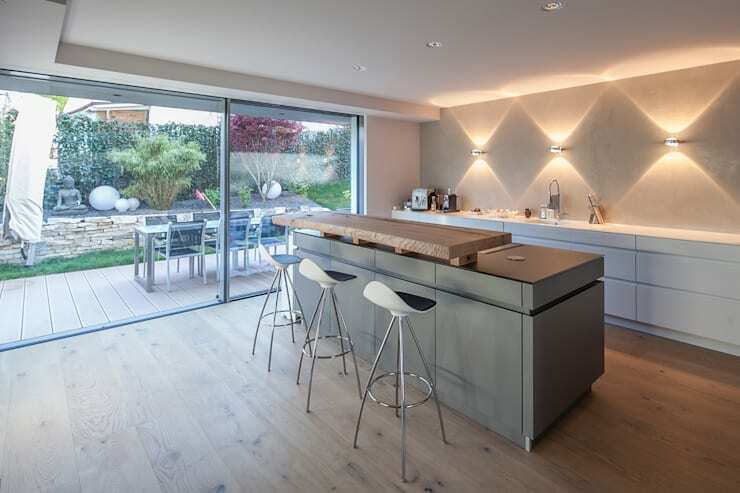 Let’s jump to the kitchen where we see dove grey tones and clean concrete touches. Wall sconces create shapes with light and add visual interest to the minimalistic kitchen. Sleek and plain countertops reveal almost nothing. The island is a unique combination of wood and concrete. Part breakfast bar and part work bench, it’s a perfect addition to a kitchen in an open plan space such as this. Outside there’s a small terrace that accommodates an outdoor dining set. A hedge and some small trees surround to create a sense of intimacy a natural setting. Across from the kitchen, we can see the full open plan space on this floor. The interiors feel spacious. 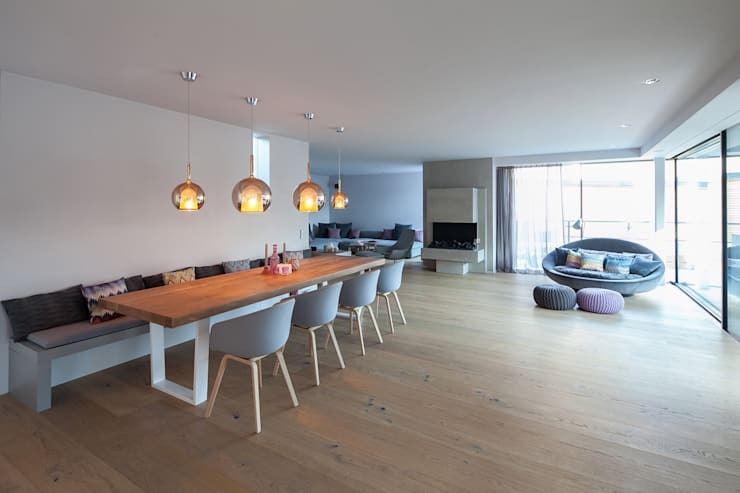 No rugs on the floor makes the natural wood shine and it gives the impression of greater space. An oval shaped oversized chair in one corner looks like the best place to spend a rainy afternoon with a book! The seat is full of colourful cushions. A couple of poufs nearby on the ground bring more coziness to the look. 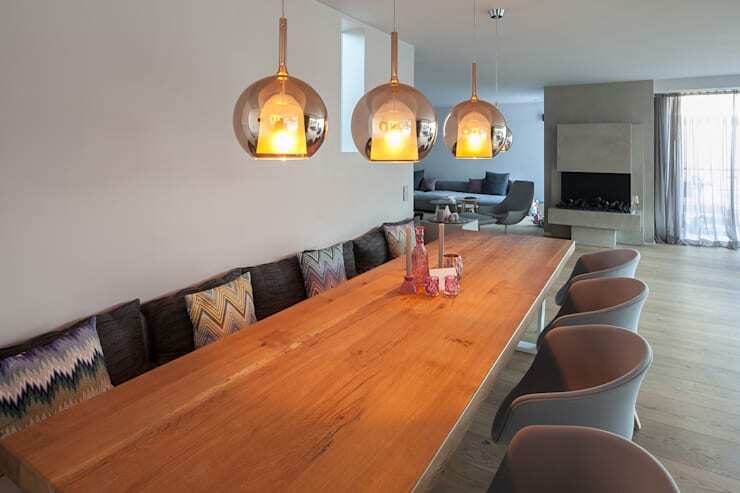 Built partly from a comfy looking bench, the dining table takes up a lot of space in the room. The light fixtures above echo the sculptural lighting piece in the foyer. This is the perfect dining table to host a dinner party or have the family over for holidays. We love the dove grey touches in the white room. It just makes us feel at ease! Check out the fireplace in the background. Perfect for completing the cozy setting. The geometric shapes interacting together creates a stunning fireplace. It’s an ingenious design. Our tour moves now to check out this incredible bathroom. The eye is drawn immediately to the floating counter in the center of the room. It’s a striking expression of clean and modern design. 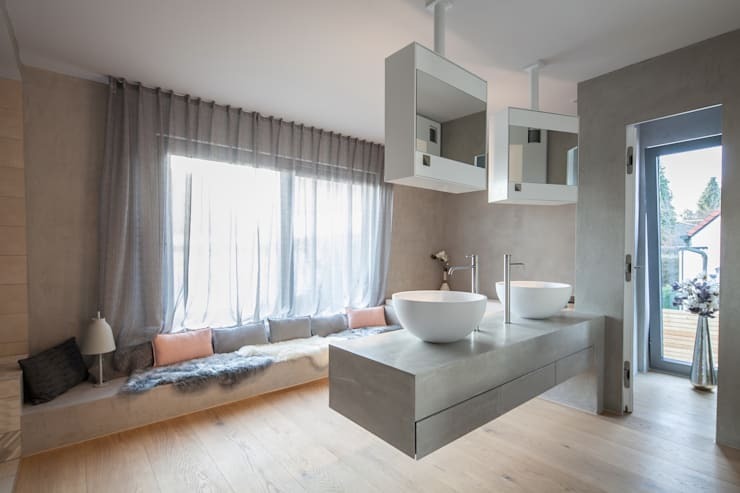 The mirrored cabinets hanging above the sinks are set at an angle to create more dynamism in the room. The toilet is set into the room where you see the window and large flower vase on the floor. The rest of the room accommodates the sinks, a vanity, bathtub, shower, and a bench along the window. The open shower is decorated with ornate tiles. Next to the shower is a storage space for towels and toiletries. 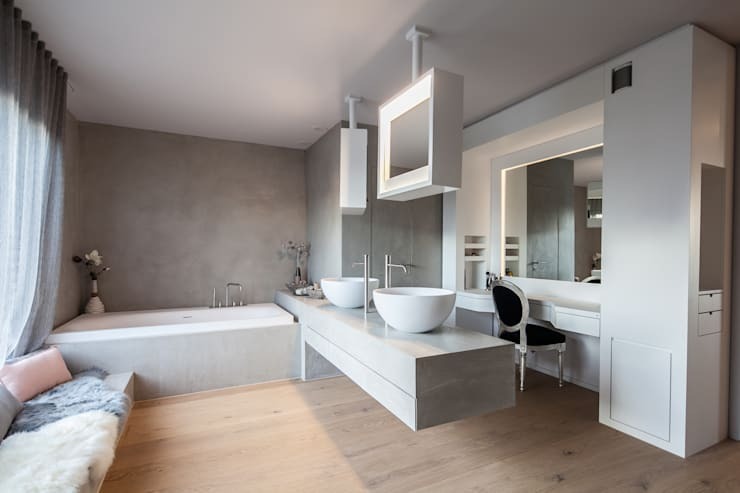 The grey tones in the room set a relaxing mood for the bathroom. A bench invites you to spend some time while you wait for your bath to fill. 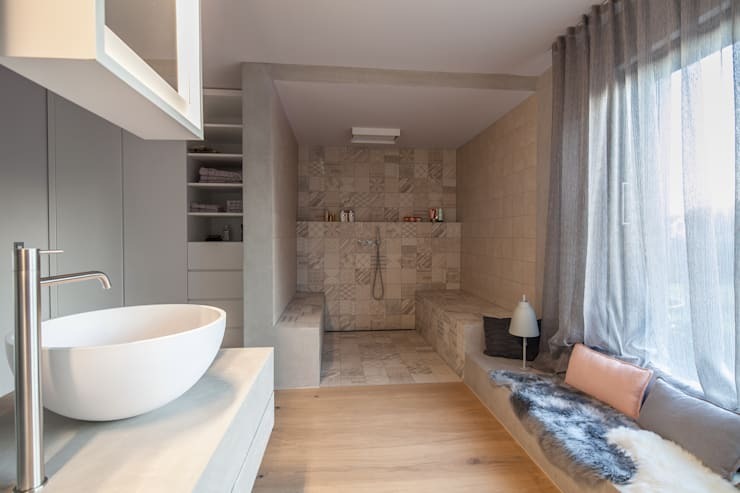 More than just a place to get clean, this bathroom is a multifunctional space. The vanity space behind the sinks is perfect for applying makeup and styling hair. Mirrors in the bathroom are lit up with extra lights surrounding them. Getting ready when you’re not hovering above the sink is a relaxing experience. This bathroom has soft design appealing to everyone who likes to take their time to get ready! Our tour wraps up with a visit to the wine cellar. The herringbone floors down here are a classy touch. 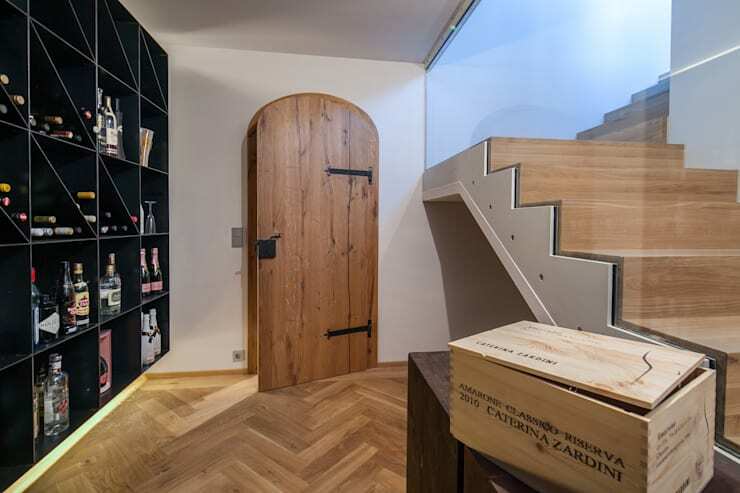 The arched door looks like one you would expect to find in a European castle. A wine crate left out on top of the dresser gives the space an authentic feel. We hope you enjoyed our tour of this lovely villa! Did you also find that the dove grey interiors really soothed and inspired? For more home inspiration like this, check out our feature on an Ottawa home that's urban casual style at its best. What do you think of the grey interiors?